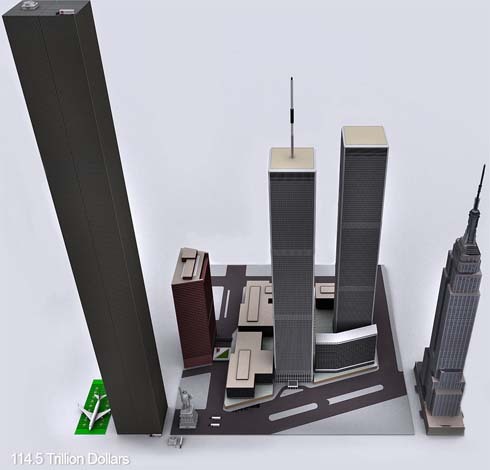 To the left you can see the pillar of cold hard $100 bills that dwarfs the WTC & Empire State Building – both at one point world’s tallest buildings. If you look carefully you can see the Statue of Liberty. The 114.5 Trillion dollar super skyscraper is the amount of money the U.S. Government knows it does not have to fully fund the medicare program, medicare prescription drug program, social security, military and civil servant pensions. It is the money USA knows it will not have to pay all its bills. Should we become more like Brazil? “……and I would answer that they need to grow a spine: President Obama’s threat that Social Security checks may not go out after the August deadline is, like everything out that comes out of his mouth, a lie.” //// Oh how a pendant clause can ruin a chapter. Lets do some math shall we? There are millions of individual bills to be paid all adding up to 5.3 T but the governments revenue is only 3.8 T. On a failure to refinance the debt of America Obama will have to “choose” which of the bills gets paid. It is true that any category of payment can be made. All foreign debt for instance, plus all active military, plus all MediCare. I don’t know where THAT subset puts us but assuming its approaching our 3.8T revenue==everything else will get nada. No park services, no meat inspection, no OSHA, no road building, no School funding etc. Did Obama lie? Mathematics actually “prooves” as rigorously as proof is possible that he did not. Article that say he did are more than suspect. They are BS. They are in fact toxic. Sad, when there is so much good stuff there==but thats what happens when one becomes an ideologue. 2nd link is from post #92. Somebody–nice website there. I posted my critique there as well as here. His blog does not appear as well attended as DU. You may be amused by his response if any? Gee, 7-seven-7 posts in a row. I think I beat Alphie. Karma prevents me from hitting spot #100. Ah well. I musthabeen a Puke in my prior life. Powdered Wig. Slaves happy to be out of Africa. The good life. On balance, the best life possible—for me. take out your weasel words and I do wonder how far away your opinion is from tcc3 and mine? Translation: take out the words and concepts you do not understand and it makes sense to you? Its a mythical condition that can be used to approximate ideas or theories. But no one should be foolish enough to think it accurately reflects conditions on the ground. Why do liberals really Communism will work? It is a strawman statement. A hyperbole to invoke a reaction. Just as many liberals realize communism is a failure as an economic model, so too do economists know that pure free market systems will fail. You say the words, but deny the reality of the politics we can see going on right now. Libertarianism is a value, but it cannot be applied as it is ALWAYS advocated. Free market can ONLY work in theory–never in practice. What does this have to do with libertarianism? Who here has advocated pure free markets? Are you attempting to claim that I am advocating such a thing because you are advocating an overbearing, centrally planned government in opposition? I’m not sure where you got the notion that by stating that market driven systems are more efficient than centrally planned ones somehow translates to a desire for absolute free markets with no regulation of any kind. No economist and certainly not myself would or has ever advocate such a thing. Regulation is needed as you say. When you say “over regulated” you show your dogma. There are good and bad regulations–not too many. Are you lazy, incompetent, or a shill? I could easily say that by arguing for over regulation you too are a shill. There are absolutely some areas and industries which are over regulated. By “over regulated”, I mean an excess of laws that are no longer applicable, inconsistent enforcement or enforcement that has failed to keep up with the industry in question. Is the financial industry specifically one of them? Hard to say. I doubt a lack of legislation is the issue with the financial meltdown so much as a lack of enforcement or competence in enforcement. Let’s not forget that plenty of regulations did exist along with both Congressional and Executive oversight over the past decade and they still could not stop the financial crisis. Regulation is clearly not the end-all solution to efficiency. One would think that a fundamental change in the risk/rewards with respect to the financial industry would be more important than more regulation of the existing practices. Have I inflicted you on the worthy Mr. Raimondo? Thomas–you defend yourself by the very techniques I use to condemn YOU and all your ILK. 1. You are right, you made the arguments for communism look just as vapid as yours for libertarianism. This proves my point and destroys your own. Ha, ha. We’ll put that down as a brain fart. 2. Jesus you’re getting DENSE. tcc3 stated it plainly–you all “claim” libertarianism doesn’t forego regulations but then all you talk about is over regulation. Don’t you GET IT!!!!! 3. I don’t argue for over regulation–I expressly argue for “right” regulation. Over regulation has proven to be coded language for remove the regulations==not make them better. Thomas–you may be legitimate but if so you shouldn’t adopt the language of the corrupt. When you say nigers is fine people, all I hear is a racist. The fact you may have some fine proud accomplished men of African roots becomes irrelevant. Its how you present yourself. Language is like that. But I suspect the reality is not far removed. Ideas and the words that express them usually come as a package. Oxymoron: free market with regulation. Somebody–ha, ha. Yes, thats how it happens. but watch how intelligent people take criticism. Although I must say his error is so extreme, I do question his intelligence. He couldn’t even limit himself to saying Obama is lying about what checks will be cut on debt ceiling restrictions being imposed. No, he said Obama lied about everything. Good thing you never resort to hyperbole. Can I assume that you were aware of the fact that Social Security has been something of a cash-cow? But even so, It looks like it will only be 45 Billion in the red in 2011. We expect to spend 113 Billion in Afghanistan in 2011. Add to that 210 Billion of unspent TARP money and 300 Billion in unspent stimulus money. Looks to me like they could find the money for SS if they wanted to. They really don’t have to stop all SS payment the next day. When you consider that Obama is a Democrat and that SS is the crown jewel of the New Deal. It would be an understatement to suggest that it has the status of a holy sacrament to Democrats. It’s not for nothing that SS is referred to as the third rail of politics. If Obama impaired the flow of SS payments and the Democrat masses got the idea that it wasn’t necessary for him to do so, it would cost him more than just his job. So yeah, as his statement made clear, (“I would answer…”) it is indeed Mr Raimondo’s opinion that Obama is lying. But I can understand your confusion as that has never happened before. Somebody–how can you be so dogmatic about what somebody else might do in the future and how can a might/maybe statement EVER be declared a lie. It can’t be a lie until the event comes, and then it is still only a maybe. And how does a lie about one maybe become a lie about EVERYTHING? No, its a failure cascade born from spin and hyperbole–not a considered opinion. I thought SS was seperately funded and was solvent for another 30 years or so? Then I read its funds were raided but the USA “stands behind them with its full good faith and credit” but thats exactly what is at issue. I can see arguments for the lenders to be paid FIRST so that they don’t raise the cost of debt even higher than they will==that just hurts everyone all over again. Then I can see paying active military First as they are after all in harms way. Then I can see paying MediCare FIRST because who wants Grandma Dying from lack of basics? But even if SS was paid FIRST against all the other first claims==seems to me like no guarantees one way or the other should be made about it. The conservative mind: so certain about everything. ….. And thats so much a part of what is KILLING America. VOTE ANYONE SIGNING A NO TAX INCREASE PLEDGE OUT OF OFFICE!!!! They want to KILL you, but they can’t do it without your vote! Why don’t I give myself permission to borrow a trillion dollars? Hey yeah! that would be cool! #106–Somebody==Well, once again, what you are asking makes no sense. If you have access to 1T you can certainly give yourself permission to borrow it. The USA Gov does have such access. YOU can even print up the same funny money the USA does. The only missing element is how you can use it thereafter–calling on the willingness of the market place to accept the fiat. If you point is that soon your goofy bucks will be worth the same as a greenback===I wouldn’t be able to call you a liar. The lie was that Obama could not guarantee that the very next batch of checks would go out. This I heard him say. The implication was that he would not be able to if the debt ceiling was not raised. Not able to the very next day. Clearly, his intention was to deceive. Well, I’m probably being too existential, but the lie would be to guarantee any thing at any time about any thing. Yes, politicians are all about guaranteeing everything but the truth is just the opposite. He could say he would hope so, or do all he could to achieve that end–but guarantee? amusing you find ((that is what it is right?)) certainty in the same definitional status that I do not. So, you lose twice. Once from the dictionary, and second from philosophy. What do you think will be the third strike? #100 I object to the use of the word strawman. You might have a point if it were not the cornerstone of so many conservative arguments. Your contrasting use of “communism” and “centrally planned economy” is a straw man. No one is advocating that. No one is proposing abolishing the free market system. But people are proposing abolishing regulation in favor of “letting the market decide.” You don’t seem to be, and good for you. You’re smarter than many conservatives/libertarians on this blog. You still are off in left field. At no time in this thread did I ever introduce the subject of libertarianism nor make any claims about it. Not once. That is a notion you introduced, claimed that I was defending, then attempted to argue against it. You are in effect arguing with yourself. I don’t argue for over regulation–I expressly argue for “right” regulation. Over regulation has proven to be coded language for remove the regulations==not make them better. Again, a straw man. I could easily reverse the claim and state that “right” regulation is veiled language for overbearing regulation and it would be equally silly. You are again propping up a claim I never made or warping a plainly written statement and then arguing against it. That’s a strawman argument. When you say nigers is fine people, all I hear is a racist. The fact you may have some fine proud accomplished men of African roots becomes irrelevant. Its how you present yourself. Perfect example of your argument style: pull ideas about your opponents point of view out of your tokhes and then argue against them. You really need to learn a new trick. Baloney. No economist nor even “conservative” (let’s just say Republican because almost none of them are fiscally conservative) is advocating a pure market economy with zero government regulation. None. As I said before, it is a matter of degree. How much is too much regulation? Why have regulation if it isn’t going to be enforced? How much enforcement is optimal? Are the current regulations being enforced? I disagree. It is a counter to the strawman of claiming anyone wants a “pure” free market economy. No one is advocating that just as no one is advocating a communist economy. “Letting the market decide” does not equate to a “pure free market”. In general, market economies are more efficient than centrally planned ones. That doesn’t mean they are efficient; just more efficient than centrally planned ones. In order for market economies to be efficient, some degree of regulation is necessary. No economist would dispute that. The question isn’t whether there should be regulation. The question is how much regulation? Of what nature is the regulation? How will it be enforced? We had plenty of legislative regulation in place prior to the meltdown and it still happened primarily IMO due to the lack of will by politicians to bolster enforcement or perhaps provide fundamental restructuring (Eliminating Fannie Mae and Freddie Mac would have been a good start). Too much regulation and it chokes the market or moves it elsewhere. Not enough and you get calamitous events like the financial meltdown. Thomas–do you read the news? Keep the radio on in the background as you darn your socks? ZERO GOVERNMENT in practical result is exactly what the Tea Party faction and only slightly less so the Republican Party is all about. Its exactly what the debt ceiling limit discussion is all about. Its exactly what the defunding of the SEC is all about. Its exactly what the refusal to approve ANY head of the Financial Consumer Agency is all about. Your “form” of argument is correct. Sadly, its just made up BS. That idea is out there and its being propagated by a very vocal element of the Right. Its not a strawman made up by liberals to win arguments. Thomas you seem to be fairly reasonable, as you are not advocating ridiculous anarchy as a solution. Unfortunately I think that sort of reasonableness is not only a minority opinion in the conservative movement, but the movement will crucify a person for it. Baloney. The Tea Party has called for less Federal regulation (in favor of State regulation). However, there isn’t one Tea Party politician calling for zero government regulation nor even nearly zero across the board. Could not be more wrong. The debt ceiling is about whether the Federal government should be obligated to financially responsible. Raising the debt ceiling simply gives them more money to spend with no onus to balance their budget. Only the Federal government sells bonds to pay bonds without it being called fraud. Again, a load of crap. Let’s not forget that the SEC was handed the Madoff case on a silver platter and did nothing and that had nothing to do with a lack of resources. The fundamental problem with the SEC is that it is filled with people that all went to the same schools, drink at the same bars and golf at the same clubs as the executives they are paid to watch. That has been true since its founding and it is a systemic flaw in any enforcement agency. The SEC is often called a revolving door as people use it to pad their resume as the move onto far higher paying jobs. No increasing in funding is going to solve that. I’m assuming you are referring to the Consumer Financial Protection Bureau. The problem is that the agency’s functions overlap with numerous other agencies. Thus, there is a fundamental question of whether the agency is necessary and not just another bureaucracy with little benefit. Perhaps instead of making up what your opposition claims, you might actually provide something tangible? So we’ve finally arrived – inevitably – at Bobbo’s final refuge. His inability to grasp the meaning of the clearest and simplest statements that refute his dogma. Simply stated: right regulations are what is needed and after that the right funding to enforce those regulations and after that the right internal rules and motivations of the enforcers. I think IRS investigators are being defunded as well even though a standard measure is that every one dollar spent in enforcement brings in 10 dollars of tax compliant revenue. Why cut that program? So, you YOU want to reduce the burden of compliance. So do I if compliance is still maintained—or for most of this discussion actcually secured? You defend too little regulation by loudly proclaiming you aren’t for no regulation. Yes, it confuses many and is excellent rhetoric. Who is right? How to tell?>>>>>>compare our system with others of similar complexity and goals. Doing that, we find we are under taxed and under regulated. Ahhh—somebody. My position is not refuted by the gainsaying of opposing statement. No, that kneejerk exercise is of no avail. Ok, I can see how deeply you’ve retreated into fantasy land. When is the last time you’ve admitted that fact, logic or history were dead against you? Somebody–I challenge you to give a specific. Then we can discuss that. Your pure rhetoric is BS. Lest anyone think I’m just name calling, Look at #68 were I mention the stagflation of the Carter years. That’s an HISTORICAL FACT that could not be dealt with by the LOGIC of Keynesian economics. Did Bobbo engage or just enter into a fantasy world where the issue did not come up? Anyway, it’s pretty typical for good counter arguments to simply not register with Bobbo. Which is why unsuspecting readers of this blog should not be overly impressed by Bobbo’s confidence in his positions. Rather, one might be well served to start with the assumption that the truth lies in the opposite direction of Bobbo’s presumptions. Ha, ha. You think anyone is “followed” on this blog? How pathetically egotistical. No wonder you are crying for attention. So, no proof/argument? Just a reference to the stagflation under Carter and your attentive followers have to figure out the equations? Whats your point? No really, you haven’t made one.